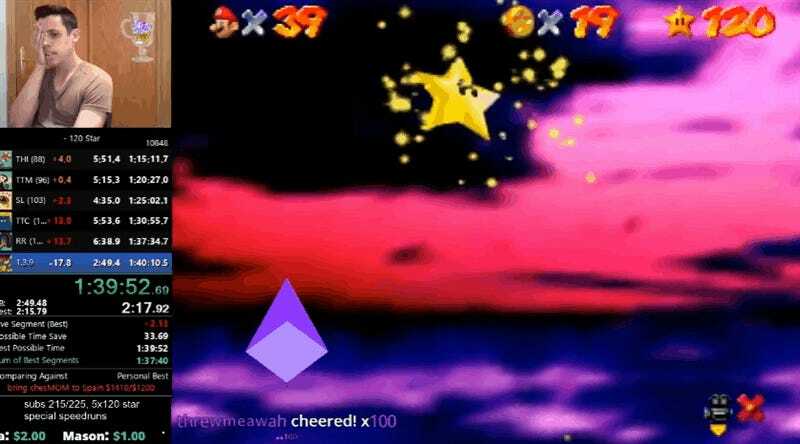 For years, speedrunners have been trying to collect 120 Mario 64 stars in under 1:40:00. People have come close, but nobody was able to break the barrier—until now. As Summoning Salt says, Mario 64 holds the distinction of having the most completed speedruns than any other game. The 120 stars category in particular is one of the most popular speedruns in terms of viewership, with some completed runs having been watched millions of times. Runs are undertaken on the Japanese version of the game, which is slightly faster. Cheese05 reportedly got his first record in 2015, and with his explosive entrance to the scene, anticipation for an eventual sub 1:40:00 time started to build up. Cheese continued to tear up the leaderboards by getting the world record time down to 1:40:05 about a month ago, and things only continued to heat up from there. Recently, runners like Puncayshun shaved the time down even further, and Batora in particular actually tied the 1:40:05 record just a couple of days ago. The competition was fierce. Fortunately, cheese05 kept going, enabling him to claim the big record last night. It’s worth watching for the near-perfect platforming display alone. At the end of the run, cheese05 gets out of the chair, squats, and puts his hands on his face. He leaves the room, and comes back with his family in tow. His grandma says, oh, you’re trembling! She asks him why he’s reacting like this. “Because I’ve been trying this for seven months,” he responds, explaining that he had finally beat a rival with his latest game. “Oh my god,” grandma says. “What are you going to do now?” she asks. The world can’t wait to find out.